Our pets give us unconditional love all year round, so let’s be sure to show them how much we love them on Valentine’s Day! You’ll find fun and unexpected ways to treat your dog or cat as well as great gift ideas for pet lovers on this list. The way to our pets’ hearts is often through their stomachs. And since you can’t offer pets a box of chocolates, these heart-shaped snacks for cats and dogs are the perfect goodies to make them swoon. Tuna is sure to melt any cat’s heart! These snacks are quick and easy to make. All you need is a can or package of tuna and a baking sheet. Open the tuna and drain the water. Your cat may come running at the smell of that tasty fish! Mold the tuna into small hearts with your hands. You can also use a heart-shaped cookie cutter to press them out if you have one. Place them on a baking sheet about an inch apart. You can add a layer of tinfoil to help prevent them from sticking to the sheet. Put them in the oven at a low temperature until they are warm. The timing will vary depending on whether you kept the tuna at room temperature or in the refrigerator. Take them out when they’re done and place one or two on a pretty plate for your cat to enjoy. Just make sure they’re not too hot when you dish them out. Your dog will fall head over heels for these heart shaped biscuits, which have the taste of sweet honey, tasty bananas, and spicy cinnamon. Mix the dry ingredients, including the cinnamon, oat flour, rice flour, and half of the wheat flour in a small bowl and set aside. In another bowl, combine the water, pureed banana, yogurt, honey, and canola oil. Blend with an electric beater. Add the dry ingredients from the small bowl and continue to mix until it’s nicely blended. Pour in the remaining wheat flour a little at a time until it becomes a stiff dough. Sprinkle a bit of flour on a surface, like a clean countertop or large cutting board, and roll out the dough so it is 1/4 or 1/2 inch thick. Use a heart-shaped cookie cutter to press out the shapes. If you don’t have a cookie cutter, you can cut the shapes with a small glass to make circles and mold them into hearts. Bake at 300 degrees until golden brown. The time will depend on the thickness of the biscuits, so be sure to keep an eye on them! Remove them from the oven and set aside to cool and harden. You can also turn the oven off and leave them in for an hour or two to make sure the biscuits are dry and crunchy. Be sure to wash the fruit or vegetables thoroughly and remove any seeds. You can cut it up into bite-sized pieces to help prevent choking. Serve them lightly steamed, baked, pureed, or raw. You can even cut them up into small heart shapes! Learn more by checking out our infographic on pet-safe fruits and veggies. If you don’t have time to whip up something special in your kitchen or your pet doesn’t go for fruits and veggies, pick up a special snack at the store. Just be sure to go easy on those goodies and check the ingredient list. Store-bought treats can contain a lot of salt, sugar, and fats, which can be unhealthy for your pet. In fact, too many treats can cause your pet to gain weight, which can lead to obesity. Obesity is a growing problem for pets and can result in all kinds of health issues from back pain and joint problems to heart disease and diabetes. Plenty of pets enjoy a good bath and brushing. It not only helps keep them clean and pretty but also supports a healthy coat and skin by stimulating circulation. 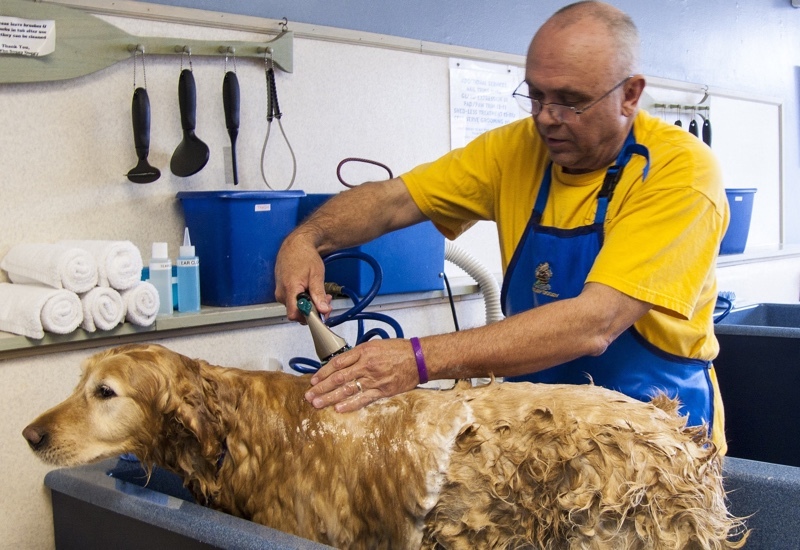 You can plan a day of pampering at home or set up an appointment at a local groomer or pet spa. Show your love for your pet in words by writing a poem. You don’t have to be Wordsworth to do it. Just think about it as a fun way to express your feelings and what you love most about your pet. It can be cute, serious, or sappy. Once you’ve finished, get down on your pet’s level and read it to him or her. Sure, your furry love may not understand all of the words, but pets can appreciate the tone of voice and the extra attention. Not the poetic type? You can also try writing a song to sing to your pet. Puzzle toy stuffed with treats—make it red for the Valentine’s Day! If you wrap your gift, consider using wrapping paper made specifically for dogs, which doesn’t contain toxic dyes. In any case, you should make sure your pet doesn’t chew on the paper or play with ribbons or bows—known choking hazards for our pals. While it’s not something you can wrap up, a pet insurance plan is a wonderful gift you can give to your pet. It can help you provide the best possible care for your pet in case of an accident or an illness. It can also cover wellness treatments to help your pet live a long and healthy life. Put that box of Valentine’s Day chocolates out of paw’s reach. Keep candy and desserts, especially if they contain the sweetener Xylitol, away from your pet. Watch out for flowers in holiday bouquets that can be harmful to pets, such as roses with sharp thorns or Lilies, which can be toxic to cats. If you would like to receive these blog posts directly on your iPhone or iPad in your news feed. Just add our channel Insurance Management Corporation in the news app to your favorites. Click here in IOS 9 or later.